Are You Kidding Me?! : Spiderman? Is that you? I have a serious phobia. Tons of people are afraid of spiders, I know, but I think I’ve discovered a new form of this: Arachnohairophobia. The fear of spiders landing on your head and not being able to find them and the nasty things crawling around in your hair. So we spotted a spider today. From across the room. It was BIG. I’m talking like quarter-sized. And fat. I didn’t want to go near it but I did not want to leave and come back into the room and wonder where the hell it was. So I sent my little one upstairs (we are careful to make sure my kids watch out for anthills so they don’t step on the ants by mistake) and I grabbed the nearest thing, which happened to be a cute animals coloring book, walked over to the spider and thwacked it. I swear, when that thing landed, it made an audible *plop*. A loud one. I have never actually heard that before. There was…stuff on the coloring book, too. Lots of it. 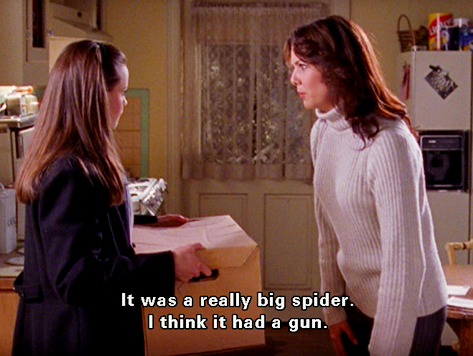 And that frickin’ thing was just sitting on the chair like a dead body I’d have to wrap up and stuff in the trunk of my car. It was disgusting. It took seven tissues for me to pick the remains up and, even though I knew I had gotten the thing, I was compelled to run upstairs and take a shower. My skin was slightly pink and my scalp tingled in an unpleasant way due to my manic scrubbing. My 7-year-old son takes karate. He’s awesome at it and I love that because I worried about him not doing well at sports. I am not extraordinarily athletic. I mean, I can drive and play Angry Birds and stuff but I’m not super strong or anything. 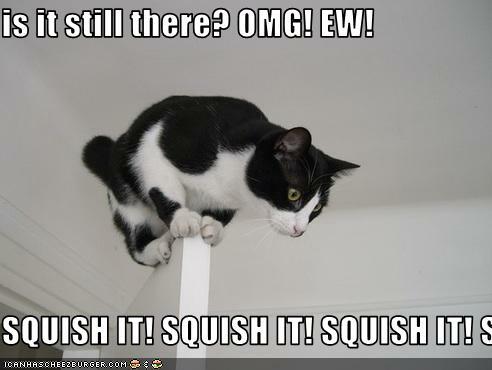 But, when I see a BIG spider near me or I walk into a spider web (those frickin’ things are, like, invisible!) I could mop the floor with any of the kids in my son’s class. Don’t scoff—these are trained karate kids. Ones I would not have been able to take if it wasn’t for the spider-phobia thing. I feel badly that my little boy heard me shriek (and quite possibly heard the spider hit the chair with that loud plopping), that I ran upstairs all flushed saying over and over to him how "Okay!" I was, and that he didn't eat lunch until after 2 PM because I just had to wash the non-existent spider out of my hair. I feel badly about all these things but sometimes you just gotta do what you gotta do.